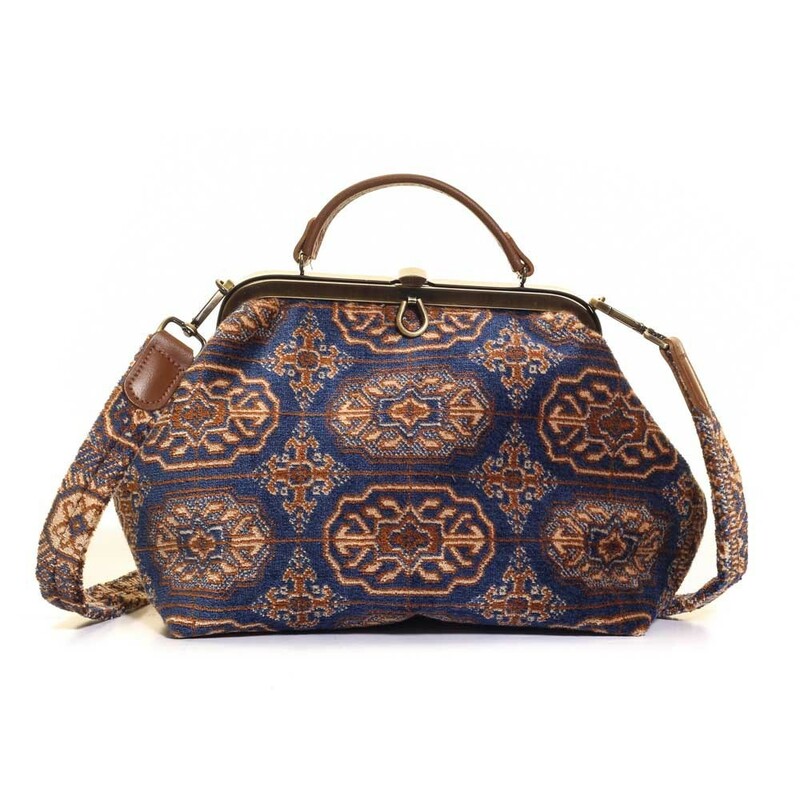 Classically elegant framed handbag/small Gladstone style bag with a leather handle and a detachable carpet shoulder strap. Cotton moleskin lining with carpet faced zip pocket and phone patch pocket. Size: 23cm (height) x 30cm (width) x 14cm (depth). Handle length 25cm, strap length 118cm. This traditional style women’s handbag is very easy to use being mounted on a sturdy steel frame with a lacquered antique brass look finish of a lustrous quality. There is a handy horseshoe shaped pull tab at the front, just under the clasp, for ease of opening. The clasp lifts up to open and you just push snap to securely close. Inside is a welted zipped pocket set in the cotton moleskin lining and an open patch pocket for small things you need to find in a hurry like your keys, or mobile phone. It is a great size for everyday use, it will look the same whether empty or full because there is a soft laminated lightweight layer behind the carpet which gives the Classic bag its structure at the same time retaining that softness we associate with the tactile nature of our Carpet Bags. You will enjoy being able to grab your Classic bag quickly by the short leather carry handle and use the long carpet shoulder strap with a leather shoulder grip, or remove it completely to use the Classic bag as just a handbag, so you can see just how versatile this bag is. Classic elegance! 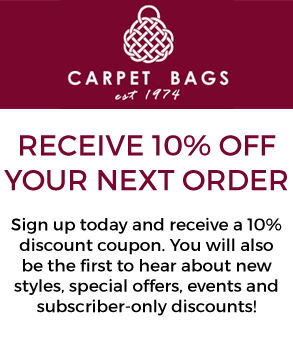 Our unique bags are hand cut, the carpet pattern placement varies on every Classic bag and we pride ourselves on the aesthetics of each individual item.